Bad UFOs: Skepticism, UFOs, and The Universe: Elizondo and the "Five Observables"
Elizondo and the "Five Observables"
Luis Elizondo, the former head of the Pentagon AATIP program and now Director of Special Projects with Tom DeLonge's To The Stars Academy, was the keynote speaker at this year's MUFON Symposium in Cherry Hill, New Jersey. His subject was, "The History of AATIP," the Pentagon's Advanced Aerospace Threat Identification Program. While much of Elizondo's talk repeated what he and others have said before, we did learn some new details on the matter. Elizondo said that the AATIP produced "five observables," that supposedly demonstrate the reality of unknown, extraordinary flying craft. First, "You're talking about instantaneous acceleration." No, that is an assumption, not something actually "observed." For one thing, that would violate fundamental laws of physics, somehow instantaneously accelerating a craft, while at the same time not smashing up whatever is inside it. We now know that the instance of supposed "instantaneous acceleration" in the Tic-Tac infrared video to which he refers is based upon an error. Skeptic Mick West wrote, "a lot of people have missed that fact that the sudden change in apparent velocity is actually due to a change in the zoom setting of the camera. When we correct for this by shrinking the 2x video back down to 1x then the "jerk" in velocity vanishes, and the movement is much smoother and slower, with no huge g-forces required." So the first "observable" is nothing more than a mistake. "The Five Observables," according to AATIP. But are these actually "observed," or just assumed? The second is "Hypersonic Velocity." This typically refers to a speed of Mach 5 or greater. What Elizondo does not explain is exactly how and where this has reportedly been observed, and how these alleged extreme velocities have measured and confirmed. Unless you know the distance to an object, you cannot calculate its speed. "Hypersonic Velocity." is an assumption, not an observation, and the claim has absolutely no credibility unless they can show exactly how it was calculated. At present, this is just an unsupported claim, not evidence. 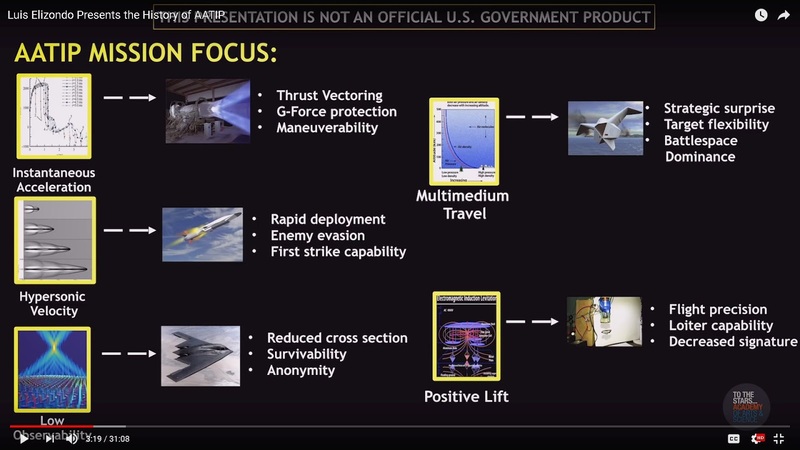 The third is "Low Observability," otherwise presumably known as "stealth," an assumption confirmed by his use of the image of the F-117 Stealth Bomber. "Reduced cross section" has indeed been part of the Defense Department's stealth strategy for decades, involving aircraft, cruise missiles, and even ships. Elizondo does not even attempt to demonstrate that stealthiness is an attribute designed into any supposed craft they have reportedly encountered. 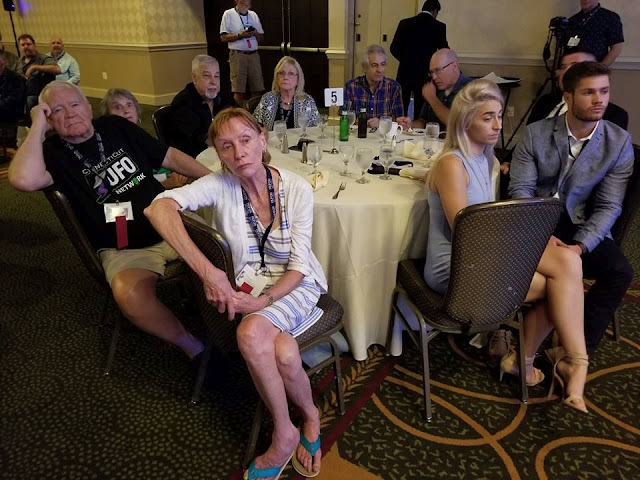 MUFON's General Director, Jan Harzan, is captivated by one of Elizondo's stories. The fourth is "Multimedium Travel," when an object can supposedly operate in air, water, and even outer space. Unfortunately, he gives us no examples of this, so it is impossible to determine whether this is correct. One suspects that because an unidentified object turned up on radar or the FLIR, and later a pilot claimed to have seen a disturbance in the water (Tic-Tac video), Elizondo leaps to the conclusion that both were caused by the same object, one capable of "Multimedium Travel." More plausible is the assumption that these were unrelated incidents, linked together in the excitement of the moment. 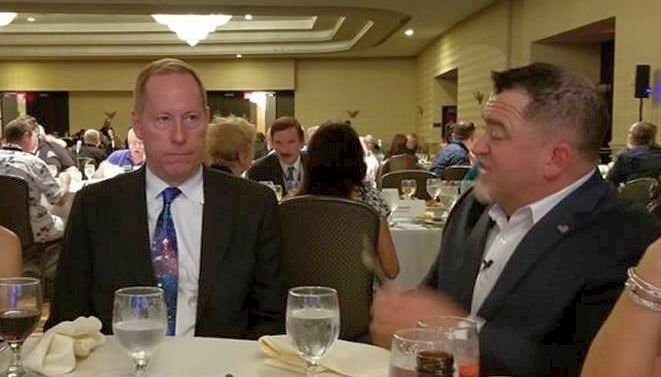 is trying to hypnotize the people at his table. The fifth "observable" is "Positive Lift," meaning "I do not have to be moving like an aircraft to generate lift under my wings." In other words, anti-gravity. This, like the first "observable", would be quite remarkable, if true. This supposedly gives you "loiter capability," meaning that you can just hover in one place, apparently without expending any energy. While "gravity control" or "anti-gravity" is a staple of Dr. Hal Puthoff's far-out physics, ordinary physicists have not yet caught up to Elizondo and Puthoff, and think this is all nonsense. Later, in a response to a question seen on the longer version of the video, Elizondo makes it clear that by "physics," he means "warping space-time" so that objects can apparently travel faster than light. He did not explain how this is to be accomplished. Perhaps he carries a black hole in his pocket? I think it would be fair to say that AATIP's "5 Observables" are more accurately termed the "5 Assumables," given that there is a huge gap in going from what they believe is being observed to proving that their remarkable interpretations are valid. These are extraordinary claims, and as such require extraordinary proof, not just simple assumptions. Clarifying some confusion concerning the project name: It recently came to light that the 'real name' of the recent Pentagon UFO program was supposedly AAWSAP, Advanced Aerospace Weapon System Application Program, and not AATIP. According to Elizondo, the AAWSAP program was founded in 2007, but in 2008 "AAWSAP is formally changed to AATIP by former program manager to focus more narrowly on the 5 observables and research of advanced physics applications." He did not name the former program manager; other documents suggest that James T Lacatski was project head until 2010 when Elizondo took over. Some people have suggested that this confusion over the name was why all the FOIA requests concerning the project had not turned anything up, but nothing much is turning up, FOIA-wise, using either name. Referring to questions about why he did not clarify this sooner, Elizondo insisted that he was "not qualified to talk about it," since he was not part of the original program. Remarkably, he appears to be "qualified" to talk about it now. Supposedly AATIP collected "volumes and volumes of information" that he could not go into detail about because it remains classified. He claims that "Much of AATIP information remains FOIA-exempt," but did not state exactly what makes it so, just that it needs to be kept out of the hands of "the enemy." He repeated his claim that the government "authorized" the release of those videos, but offered no proof of it, in spite of a Pentagon spokesman's clear denials. In the question-and-answer session, Elizondo dodged specific questions, and spoke only in the most general terms, repeating what has already been said. At the end of the Q&A, Travis Walton spoke to complain about the poor quality of the questions asked of Elizondo. 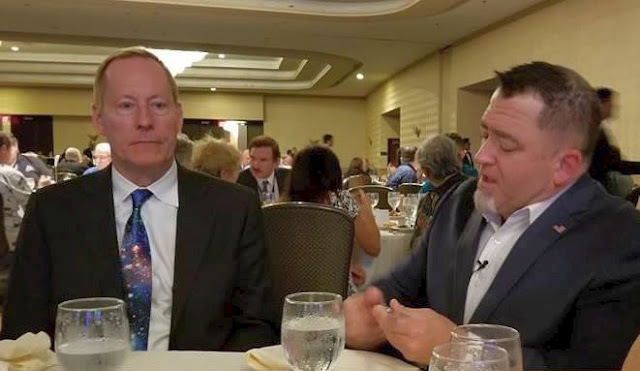 Walton was disappointed that people didn't ask Elizondo questions he could answer, "rather than constantly pressing for things that you can't, or shouldn't" answer. The problem was, however, that there didn't seem to be any kind of interesting question that Elizondo would answer. The audience is thrilled by the dramatic revelations at the 2018 MUFON Symposium. Elizondo began his talk with the prediction, "I think the same time next year we're going to have a fundamentally different conversation," apparently implying that everybody will then be convinced that aliens are here. Let's re-visit that prediction on July 29, 2019 to see how well it holds up. My predicton is, at that time the conversation will still be same old, same old. And the days grow short, when you reach September. Folks, act fast - don't miss this opportunity to give your money to Tom DeLonge! Did he describe how he currently makes a living ... like, who pays his salary? My understanding is that Elizondo works for Tom DeLonge in "To The Stars." He has a title (or two) there, 'Director of Special Projects.' In fact, they even had a short video not long ago showing DeLonge and Elizondo riding to work together on a fancy motorcycle (with DeLonge in the sidecar). Any or all of the above are usually observed in wannabe paradigm-busting "UFO" myth advocates. I think you need to learn a little bit more about how targeting and fire control radar systems work and their processing and integration systems, both on the F/A-18 and onboard an Aegis outfitted ship. You are making armchair doubt pontifications about this specific engagement series, the system measures and their operators - about which you know nothing. And using general ignorance about the capabilities of such systems (especially in this circumstance which has repeated over and over in the military, especially the Navy), you are able to raise artificial and pseudoscientific doubt. Mr. Anonymous, I suppose it could be true that Elizondo has good evidence to back up what he is saying. But if so he isn't revealing what it is. Let me guess: "it's classified." So all we have here is another "trust me, I'm an expert, I have this wonderful evidence but I can't show it to you." This has happened many, many times before in UFOlogy. Do you remember the Roswell Slides? If there is evidence from targeting and fire control systems, then it needs to be brought forward and discussed. And evaluated by private experts on those systems. What we have seen thus far does not inspire condifence in the "expertise" of AATIP investigators. Remember the "glowing auras" that were headlined in the very first New York Times story ablout the AATIP? These were nothing more than processing artifacts, which should have been obvious to anyone who did even the most elementary analysis of that infrared video. So all those AATIP experts spent years telling each other that these objects had "glowing auras"? And then there is the elementary-level mistake where the AATIP "experts" concluded that the object displayed "instantaneous acceleration" when in fact all that happened was that the zoom factor on the camera had changed. And THESE are the "experts" whose conclusions we are supposed to trust concerning data we have not seen? As you perhaps know, Chile has its own version of AATIP, a UFO investigation program within their CEFAA. They have not done any better. Several years ago, with great fanfare, they released a video that all their experts had studied and pronounced unexplainable. It was promoted endlessly by Leslie Kean. The UFO turned out to be just a fly. Then a few years after that, the CEFAA "experts" released another UFO video. Leslie Kean touted that one, too. This turned out to be just a distant jet airliner. Mick West even figured out what flight it was. So no, I do NOT have much confidence in government "experts" making pronouncements about UFOs. Now I remember. I've seen these pics on UFO Updates. Yes, I think I saw them there, too. MUFON couldn't draw a crowd with a box a crayons. Elizondo seems to be even worse. He couldn't draw flies if he were a leaking colostomy bag... Reading your captions under the photos on this droll Sunday made my day, especially the Travis Walton one! It's easy to be hypnotised by Travis Walton if you continue staring at his hairpiece. Thanks for continuing to work on this, Robert. We are certainly justified in expecting evidence supporting the claims. When TTSA, Bigelow associates and company claim to be conducting scientific research, there are standard protocols which must be followed, else it is indeed not science. Among such standards is most certainly the presentation of evidence which supports the conclusions. We have every right - and arguably responsibility - to continue to request documentation of project objectives, methods of research, methods of measuring progress, deliverables committed to the funding agency, etc. It is simply unreasonable for self-described project personnel, researchers, and their supporters to demand claims be accepted absent such documentation. "Let's re-visit that prediction on July 29, 2019." One remarkable achievement of 70 years of UFOlogy: they've predicted "disclosure" for more dates certain than the return of Christ has been calendared (and reset and reset and re .....) -- amazing, as they've had 1930 years less time to get that done. But I bet if we did a count, they're in the lead on predicting the Change Of Everything and then coughing politely and moving it to another day. Thanks for your continuing work on this, Robert. As long as self-described AATIP personnel, TTSA and the related associates fail to produce docs verifying project objectives, methods, measurable results, etc., then questioning the circumstances is entirely justified. Similar can be said for what currently amounts to little more than Skinwalker rumors. If Elizondo, Team Bigelow and company claim to use scientific methods, then certain standard protocols apply. One of those standards certainly includes presenting adequate evidence to justify conclusions, or at the very least explain how conclusions were formed. Elizondo the man who worked for the secret Pentagon ATTIP holds patents for marine engineering and has spent a career in military intelligence. This made him the perfect man for ATTIP which was nothing but a 'cover' for the testing a new class of submersible and flying drone ('the tic-tacs' in the video released by 'To the Stars', taken by Elizondo from ATTIP) . These were being tracked by the USS Nimitz after they were launched from the submersed submarine USS Lousiville (SS -724) which has been confirmed as being in the area. The ATTIP programme spent $22million in 5 years investigating UFOs. Yet the SETI program receives approx $13 million a year to scan for alien life in addition to the $100million already spent on infra-structure. In other words the Pentagon would not spent just $22mil over 5 years investigating 'advanced threats from unknown sources' but it would spend $22million over 5 years on a smokescreen or 'limited hangout' to protect the new class of drone that can be launched from a submerged sub. These drones are similar to Lockheed's Cormorant (declassified) who was also developing to win the contract, but I believe a different company's drone won, as clearly the tic-tacs although of the same class are NOT the same as Lockheed's submersible flying drone. This new class of drone, is a class of MPUAV and made to be launched and retrieved from a submerged OHIO-class of submarine like the USS Lousiville (SS -724) which was in the area at the time of the 'tic tacs'. Operationally they are deployed on time sensitive targets, they have a modular payload and a SOF communications relay. The technology is used in the fight against 'terrorist' threats in foreign theaters, where small teams of Special Operations Forces are conducting all weather reconnaissance and need a convert quick strike option. Thanks hope you enjoyed this little bit of research. "Elizondo said that the AATIP produced "five observables," that supposedly demonstrate the reality of unknown, extraordinary flying craft. First, "You're talking about instantaneous acceleration." No, that is an assumption, not something actually "observed." For one thing, that would violate fundamental laws of physics, somehow instantaneously accelerating a craft, while at the same time not smashing up whatever is inside it." You're wrong Robert, I witnessed "instantaneous acceleration" 3 times! My sighting has been on the web since nascent UFO forums such as those starting with alt. in the '90s. Here's my sighting in the early 1980s in North Hollywood, CA. One night I went to our building's pool, illuminated by pool lights so the area around the pool was dark. I brought my 7-12X zoom binoculars. The sky was clear and star-filled. As I scanned with my binoculars on 7X I saw 3 stars in a vertical row, perfectly spaced apart. Not unusual but a sight. I started to move my head away when I saw the top star accelerate instantly at an extremely high speed towards the south. A second later the middle star did the same followed by the bottom 3rd star. Of course, they were not stars. Whatever they were laughed about our laws of physics. You cannot say that what I saw didn't happen, all you can do is consider that not everything happens like you say it should. BTW, I'm a 100% natural skeptic but I have had 5 UFO sightings, taped 1, and they are of the highest quality sightings one can hope for. There's no shortage of reports of lights in the sky moving counter-intuitively. I've seen lights seem to make right-angle turns--one light instantly becomes two moving at opposite right-angles to the original path. Or a light that suddenly appears, grows brighter holding its position for seconds, but then instantly drips or flutters to earth and disappears. There's a pretty simple--most plausible--answer for these, similar (like yours) and all manner of other such observations. It's a matter of the meteor's size, composition, speed and angle of entry, and human perspective from the surface of the Earth under a dome of atmosphere. But I was, Ed. You were perfectly clear. With my own examples, like yours, I said that seemingly stationary points of light in the sky are actually moving in your line of sight. And as they approach they suddenly appear to jump to a start. A rare enough occurrence but skywatch enough and you'll see all kinds of seemingly strange things that are simply meteors, space junk and earth-crossing asteroids. So no "instantaneous acceleration." And no "UFOs" of any kind. 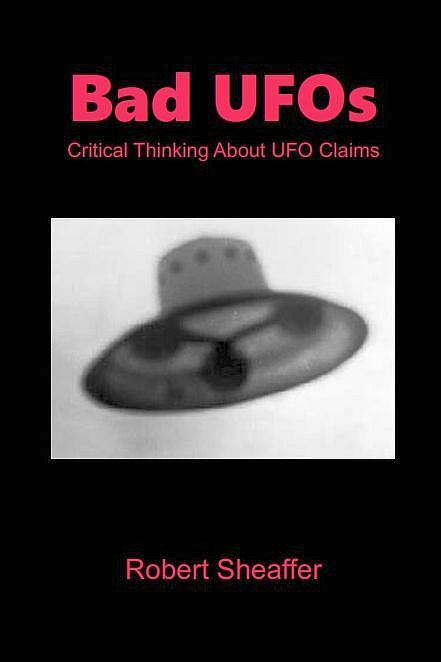 There are no "UFOs," only reports of failure to identify. Your comments prove only one thing: that you are out of touch with really and are a denier. There ARE UFOs, you just haven't done enough skywatching to catch one. All over the world people see UAPs and while some are mundane sightings of normal sky events, very few humans have trained themselves to separate the aerial wheat from the chaff, I'm not one of them. I wear Polarized sunglasses on purpose, not just to cut glare but to isolate whatever catches my eye in the sky. If I were to describe my first sighting you would not be able to utter a single word for your brain would fail you. The 3 "stars" that I saw cannot be explained by you nor anyone else. I was fortunate but that was because I made an effort to look for UAPs. I have skywatched most of my 80 years, have owned multiple telescopes, some amateur quality, some professional quality. I know why astronomers cannot see UFOs or whatever. You stance on UFOs do not show that you have an open mind 'cause you, an inexperienced individual, are trying to place yourself above those who have had sightings and those who have recorded quality videos of UFOs. Instantaneous acceleration is not possible with earthlings but UFOs and their possible entities are not affected by our physical laws. You would improve your life if you broke out of your closed mind and accept that there are other realities. One of those is in the audio range. There are frequencies we cannot hear but animals can. Same with sight. Let me go on record that I do not accept extraterrestrials from anywhere outside of our solar system as there seems to be evidence for them. But whether they visit us is uncertain. As close as the moon, yes, and Mars, and possibly Jupiter. But not from other galaxies. I didn't end my comments properly as I failed to include that I've read a few similar comments after doing an internet search. If the sightings are "highest quality", they would withstand scrutiny by scientists. Have you submitted them for scientific evaluation? If the answer is no, the obvious question is "Why not?" I have not seen a single UFO video that I consider overly compelling to convince me UFOs are something extraordinary. Your anecdotes are just that and are really inadmissible as good evidence without confirmation. However, your claim that you have taped one and it is of the "highest quality" has me interested. Do you have a link to said video and does it have particulars (i.e. date, time, location, etc)? I know a group of individuals that might be interested in evaluating the video if it is of "high quality". Hi Tim: I've been aware of you for many years particularly on UFO forums. But I'm surprised at the lack of logic in your reply. There's nothing to supply to scientists for scrutiny. I had an unusual sighting. End of story. It's too bad you have not had a compelling UFO sighting, but then you're not alone, you are in the company of many millions or billions. A quality UFO sighting is rare. It is understood that anecdotes are not good evidence but that is all one has. Since I don't have a belief system all I can say is I accept or I don't accept. And I didn't say that my taped UFO is of the "highest quality", my sightings were. Here's one of them and I'm sure you'd like to experience same. One day I arrived at a bus stop and looking at the sky above across-the-street buildings I saw a small, wispy, almost fully transparent cloud. But "hiding" behind it was a white "orb" just sitting there. Without taking my eyes off it I brought out my digital camcorder from my backpack. Since I had trained myself for any event, as soon as I grabbed the camcorder I automatically turned it on and pushed the recording button as I brought it up to my eyes. I looked the viewfinder and was shocked that it was dark with a message that said my infrared filter was activated. The night before I had shot footage of my neighbors' back yards for a reason I won't go into here. I forgot to put it back to "normal" and at the bus stop, when I took the viewfinder away to reset the camcorder, the cloud was still there but the white "orb" was gone. Natch! My video is only good because it shows a fixed white "orb" in the clouds while airplanes from La Guardia airport ascend. No one can evaluate it. There are a million superior videos and no scientist would bother to deal with videos. That's why there will never be "disclosure" because there's nothing to disclose since no one has ever shot anything but great videos that scientists cannot assume anything from and that's all that Uncle Sam has. But it's good to hear from you. My logic is perfectly sound. You claimed to have had high quality sightings. If that is true, there would be more evidence than just your own personal story. All you have is a story about an event that you could not explain. In my opinion, the lack of details for such a sighting and any evidence to back up the story means it really is not that "high quality". Therefore, it does not confirm anything. I also would be interested in seeing these "million superior videos". If we are talking about Youtube, there are a lot of them that are fake or can be explained. By high quality sightings I mean that I have identified non-human objects in the sky. After spending 4 years in the Air Force and educating myself on almost every human constructed aerial craft I am not fooled into misidentifying. My polarized sunglasses are a big help in daylight. I don't put much store in night sightings. Tim, no one can provide you with the answers to the questions that you ask as they are extreme. Millions of people blindly believe in Jesus yet not a single one has ever seen him and there is not one iota of irrefutable proof for his existence. My high quality sightings satisfy only me. I don't try to convince anyone to accept my word. I lay it out there and you have a choice but not a choice to criticize as you are not in a position to do so. An opinion is valuable only when it is an educated opinion. When I describe a sighting I supply all of the details available to me. There are some videos of UFOs that have passed scrutiny by professional and acclaimed film technicians and since it's your words against theirs, I go with their analyses for they supply more than an uneducated opinion. Tim, without insulting you, your archaic views are in the minority and, therefor, meaningless. You have your admirers and supporters but since you all are of like minds, it is nothing to write home about. Tim, it's time for you to realize you're living with questionable thoughts that prevent you from seeing the bigger picture. You don't know everything about our reality that includes unknowns. Be curious, don't be a rigid thinker. I'll mentor you. I had fashioned a lengthier reply to you, but further reading has convinced me of its futility. You are either a troll, deluded or a deluded troll. Therefore, no further discussion will have any value. I think that you have mistaken me for someone who cares about your deluded self-worth. Your worthless reply proves me right. If you had any balls you would post your comments and try to show me the light according to your obvious distorted beliefs. If you were going to side with Tim Printy, then I'm glad you didn't bother. I am curious. Evidently, you haven't come here to be dissuaded. Neither do you seem to trying to win any converts- well, if you are, you're doing it wrong. Food for thought: Alex Campbell had over a dozen "good sightings". His were significantly more detailed than yours and described something that was proven to exist at one time. Somehow, we still doubt the Loch Ness Monster exists.